Meltingly soft Moroccan honey glazed eggplant, covered with a sweet and spicy honey and harissa sauce. Vegetarian and gluten free! If you asked me 10 months ago if I used honey frequently, I would have said no. Honey? No way. I mean, it’s always in my kitchen (both the generic kind and the super fancy Philadelphia Bee Company raw honey from bees in my neighborhood — because yes, they actually sell the honey by zip code so you can get the one closest to you), but do I use it much? Nope. I might put in tea when I’m sick, but that’s about it… right? And then you have a baby. A baby who eats everything you eat for dinner, thanks to baby-led weaning. A baby who, because of the risk of botulism, is not supposed to consume any honey or anything made with honey, until his first birthday. And suddenly it dawns on you that yes, you do actually use honey frequently… perhaps not in baking, but most certainly in cooking. Sweet and spicy… sweet and sour… such wonderful savory pairings. Things marinated in honey. Things stewed in honey. Recipes with just a tiny bit of honey to bring out some unexpected sweetness. Anything made with honey mustard. Sesame honey chicken. Sweet and spicy chicken skewers. My absolute, most favorite, roasted eggplant and smoked almond dip. All of it, on hold. 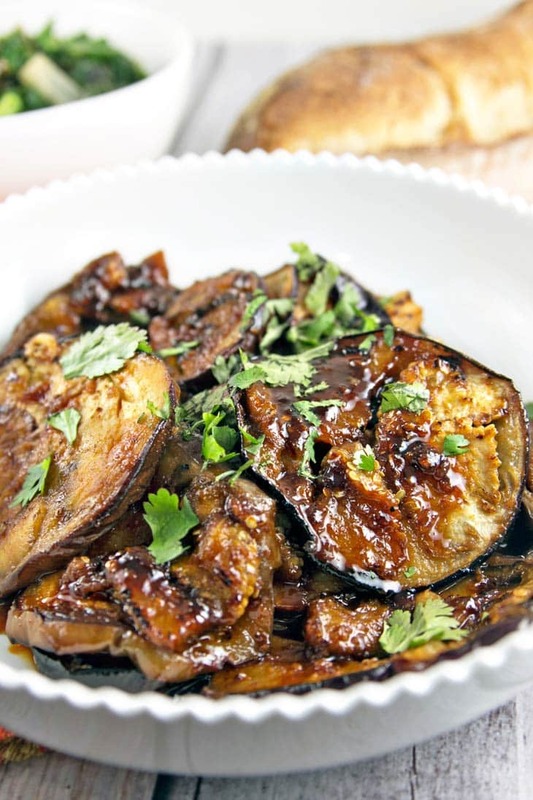 But without a doubt, the thing I miss the most of all is this Moroccan honey glazed eggplant. 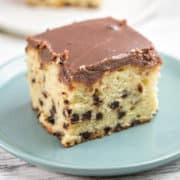 Have you ever had those kind of dinners where you’re not entirely sure how something is going to turn out and you take one bite expecting it to be average and are just completely blown away? That’s how this eggplant was for me. I’m an eggplant fan and definitely enjoy the sweet-spicy combination so I thought this would be good, but it was outstanding. 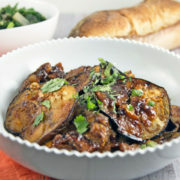 Soft eggplant, stewed until it nearly melts in your mouth. Sweet and sticky from the honey, a kick from the harissa. Minced ginger, the warmth of cumin. Just a slight sour tang from some fresh lemon juice. A handful of fresh cilantro tossed on top for garnish. Serve with a loaf of fresh, crusty bread and a big pile of sauteed greens and call it dinner. And lunch the next day, if you have any left, because it’s just as delicious cold as it is warm. Oh, and P.S. — this Moroccan honey glazed eggplant is also vegetarian and gluten free, but you won’t even realize it (just check for hiding gluten in the harissa). Mostly, I’ve been feeling a little sad about Ryan’s upcoming first birthday. An entire year will have come and gone in the blink of an eye and my baby will no longer be a baby. But knowing that in just a few short weeks, this eggplant can go into our regular dinner rotation? That certainly makes a bittersweet moment just a little sweeter. 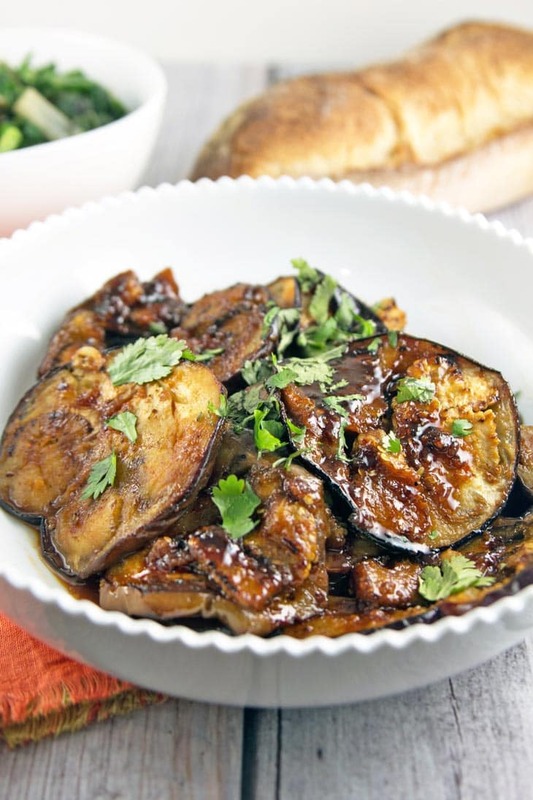 Meltingly soft eggplant, glazed with a sweet and spicy honey and harissa sauce. Vegetarian and gluten free! Spread the slices of eggplant on a towel and sprinkle both sides generously with salt. Allow the eggplant to sweat for 15 minutes, then wipe the pieces dry with a paper towel. Preheat a large, heavy skillet over medium-high heat. Brush both sides of each slice of eggplant with olive oil and cook, without overlapping the slices, until well browned on both sides. 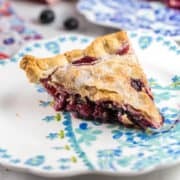 Remove the slices to a plate and set aside; repeat with remaining slices. Combine the honey and lemon juice with 1/2 cup hot water in a small bowl, stirring until the honey is completely dissolved. Add the garlic and ginger to the now-empty skillet and stir for 30 seconds, or until fragrant, followed by the spices. Stir in the honey-lemon mixture and bring to a boil. Place the eggplant in the pan, overlapping as needed, and cook over medium heat for 10 minutes, turning halfway through to ensure all pieces are coated with sauce. Continue to heat until the sauce has turned into a thick glaze and the eggplant is soft. Thanks, Adina! And I'd like to grab it, as well — I am literally counting down until my little guy can eat honey and I can make it again. Can't wait! Thanks, Claudia! I hope you love this as much as I do, and yes, not too much longer to wait until we can enjoy it again. 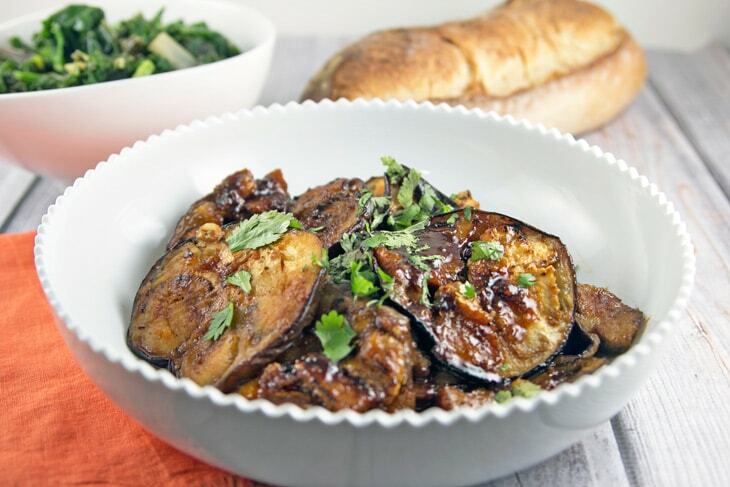 I love eggplant as well, so it's always exciting to find new ways to prepare it! Mmmmm ! Did it this week and loved it. Will do it again for sure. When do you add the harissa and cumin? Hi Esther — add the cumin and harissa after the garlic and ginger, but before adding the honey lemon mixture. Enjoy! We enjoyed this unique combination of flavors. Next time i will go a bit lighter on the lemon juice. My lemon was quite large and the sour out shown the other flavors… but there were hints of greatness. Will try it again for sure. Glad you liked it, Betsy – but sorry the lemon juice was too strong! I’ll update the recipe to “small to medium” sized lemon; I can see how a large lemon could be too much! Just made this dish. It will be a new staple in my houseI Delicious and easy ingredients I mostly have on hand! Thanks, Jamie – so glad you love it as much as I do! Obsessed with these! Have made them multiple times already, so yum! Oh my gosh! This was amazing. absolutely amazing. 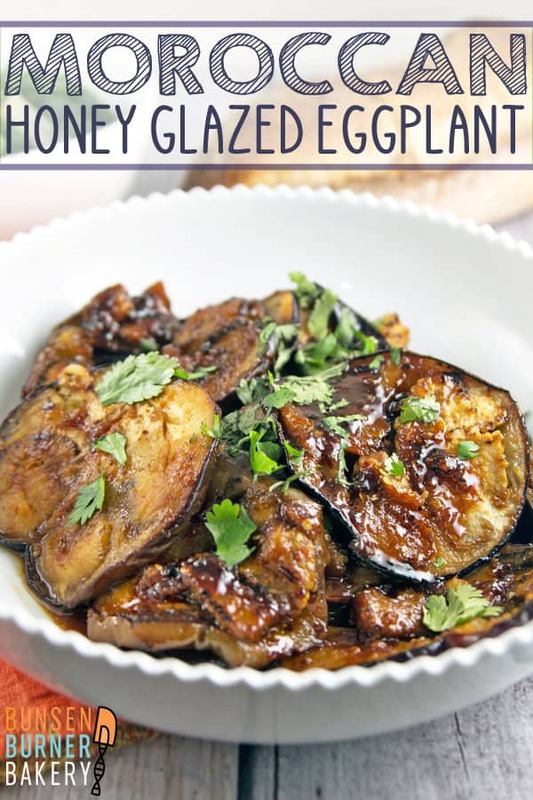 I did not realize that egg plant was so versatile, but this one takes the sweets. I have experimented, just a tweak, and found that chopped, toasted walnuts put into the sauce at the end of the cooking time is like the cherry on top for this dish. It makes for a bit of a crunch. I used one cup for two large egg plant globes. My husband who is not a fan at all of the tired “dipped in egg wash, dipped in cornmeal/flour, then deep fried to a soft consistency” person. I did not even tell him what it was, he loved it from the first sweet and spicy bite. Best note here, I found that THICK slices are best. I used my grill and flipped twice side to get the cross hatch marks, and found this is as long as they needed. Once cold, place a slice of feta cheese on top for a unforgettable lunch. Or top that with a second, cold slice and make a sandwich to remember. 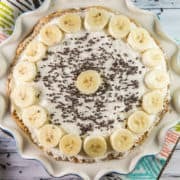 Thank you so much for this creative take on a time worn recipe! I’m so glad you liked it! I love love your idea of adding the walnuts at the end and the feta. So happy your husband enjoyed this as well! I have never tried harissa with eggplant before – but I think this is definitely one worth trying. It looks and sounds so appetizing. I love harissa and want to try it in more recipes. Thank you so much for sharing! How far ahead can this be made? Made it twice already and….kaboom!!! Amazing!!! I actually have no idea — I’ve made it and enjoyed the leftovers for a few days, so I’d guess maybe 2-3 days ahead of time? The eggplant will get a little soggier over time, but it’s so soft and melty to begin with, this isn’t necessarily a bad thing! This was a great surprise. I have been using other Mediterranean and Middle-Eastern flavors. That touch of honey and heat was the nect level. Thanks, this will be saved and repeated often. I’m so glad you liked it, Peggy — it’s one of our favorites. I love that sweet and spicy flavor combination! i love eggplant, cilantro, and the spices, but i don’t like honey (it’s too sweet for me). instead, i’ll use silan (date syrup), which is probably more traditional than honey, anyway. i’ll also use cumin seeds, toasted and ground in my mortar. i might top this dish with toasted pine nuts, too.